When it comes to NCLEX RN preparation, you’re certain that you’ve got everything down pat. You’ve studied up on the requirements so often that you can practically recite them in your sleep. You know what’s expected of you as a registered nurse – and what’s more, you know how to apply that NCLEX preparation knowledge on the actual exam. In fact, you’ve reviewed so many NCLEX RN sample questions about diseases and conditions that your friends now refer to you as a walking Wikipedia! If you’ve reached this level in your NCLEX RN preparation, then it might be tempting to take a break and give yourself a pat on the back. But I’ve got news for you. It’s the nursing students who’ve prepared the most who often fall for the biggest careless testing mistakes. And what’s more, these little exam center mistakes can quickly add up to spell out failure. It’s easy to miss the cracks in your NCLEX-RN test preparation I’ve seen many registered nursing students who focus so much on achieving the bigger examination requirements that they often overlook the little things too. What’s even more frustrating is that when they fail their NCSBN exam, it’s not because their knowledge of nursing was inherently flawed. It’s just that they didn’t see the cracks in your test prep. Think of these cracks as a hairline fracture. Sure, multiple fractures in the bone might hurt more – but they’re easier to spot and treat. But those hairline fractures can be easy to overlook, yet they still cause just as much pain and misery. And in nursing terms, that pain and misery is absolutely unacceptable. So what can you do to ensure that your preparation for the NCLEX-RN exam hasn’t suffered from a debilitating hairline fracture? Simple: you can study up on these testing requirements and start to get familiar with how to spot careless mistakes that add up to failure. Grab a cup of coffee, sit back and relax – these practice strategies are about to take you to another level of testing success! Computerized NCSBN testing means that the chances of filling in the wrong answer circle are all but eliminated. But don’t let this make you too comfortable – in fact, computerized testing comes with a whole host of new problems. One thing’s for sure: read all the directions before you start the test. Once you answer a question, you can’t go back. Don’t select answers based on what’s best for you as a RN nurse. Instead, select answers that are best for the patients. Many potential nurses make the mistake of eliminating empathy in their NCLEX-RN exam practice. However, the test makers want to ensure that you’ll be a kind and caring nurse. Above all, ensure that you have plenty of scrap paper to work out those tough problems. Many test takers often underestimate how much scrap paper they’ll need – and that leads to problems down the road. Want NCLEX preparation questions and review materials online? 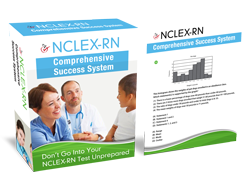 Check-out this free test prep report: FREE NCLEX-RN Review Study Guide Online.